Storage drawer doesn't need to be boring. 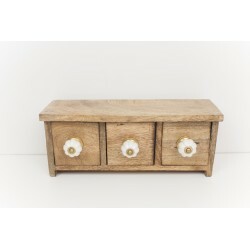 In our stock we have wooden drawers in geometric finish with three or four drawers and many more solutions for you. Storage Solutions There are 3 products. FOUR WOODEN GEOMETRIC DRAWERS These geometric drawers have four compartments each with a different pattern making them really stand out. The drawers are great for organising jewellery or stationery, and will make a great addition to your homeware range. 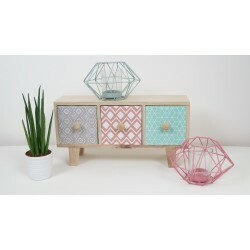 THREE WOODEN GEOMETRIC DRAWERS These geometric drawers have three compartments each with a different pattern making them really stand out The drawers are great for organising jewellery or stationery, and will make a great addition to your homeware range.